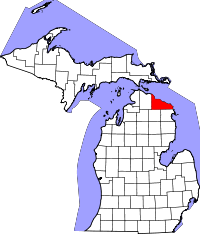 Located on the Lake Huron border of the southern half of Michigan, almost 75% of Presque Isle County's established area is water. Because of this, as well as the large amount of forested areas, the county population remains fairly small, however the Vital Records Department with the County Clerk provides detailed information on the dates of availability of the county's records. Naturalization records begin on 10/8/1875, marriage records on 05/24/1872, birth records on 01/26/1871, and death records on 08/06/1871. All continue to the present and are open to the public excepting birth records dated after 01/01/1902. While the genealogy research hours are listed at Tuesday, Wednesday, and Thursday from 9:30AM till 11:30AM, then from 2:00PM till 4:30PM, those hours are known to fluctuate due to court conflicts. Because of this, as well as limited space, individuals are required to contact the office either by phone or email beforehand to schedule a research appointment.